I believe wedding invitations are important. They create a bit of excitement for the day and makes sure guests have all the important 'What-Where-&-When's. It can often can give guests an idea of the type of wedding they'll be attending. We did consider e-vites but decided against them as we felt there was nothing nicer than receiving actual post. Our wedding invites were posted just over 2 weeks ago and we've already had some RSVPs from friends and family, each has made me more and more excited for our Wedding day. We've asked for RSVPs by email as we thought this would be most convenient for everyone. I got the inspiration for our wedding invites in the lift at the Grosvenor House Hotel in London when I was there last October. They'd taken a page from a book and printed the information about their restaurant over the top. I thought the style was perfect for our wedding so sent Jim and picture to get his opinion - he approved. We wanted to have a quote on the front that wasn't too cringey but was romantic and meant something to us. 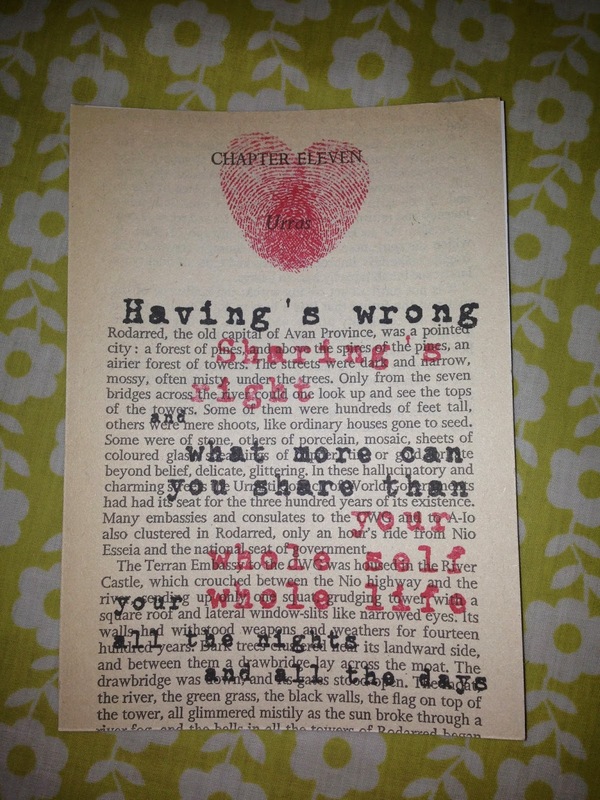 The quote we chose was from a book that we'd both read while I'd been in Edinburgh which we thought suited our wedding. I'd written it in my diary when I'd read the story and stumbled across it while rummaging through bits and pieces in my room at mum and dad's house. This delightful quote is from The Dispossessed by Ursula Le Guin. It's a sci-fi novel (but don't let that put you off), and the action takes place in an anarchist society. We found it really interesting to see how Le Guin envisioned personal relationships in this fictional world, and how personal relationships like love and family might behave without the attachments of property and state interference. It's a really good book and generated a lot conversation points. We know our invites aren't maybe as traditional as some people might expect but we felt these better represented us and what we want to celebrate in a couple of months!